Ulfric Stormcloak of the Stormcloak Clan is known as the rebellious Jarl of Windhelm who started the uprising against Imperial rule known as the Stormcloak Rebellion. An incredibly divisive and controversial figure, Ulfric brought the Empire to its knees and pitted Nord against Nord in a bid for religious freedom and political independence for Skyrim. Little is known of Ulfric before 4E 176. He inherited the role of Jarl of Eastmarch from his father, and carried on a rivalry with Jarl Balgruuf the Greater of Whiterun since they both were young. He studied under the Greybeards at High Hrothgar to learn how to use the thu'um. He is branded a racist by some of his detractors, possibly because of his indifference to the situation of the Dunmer in Windhelm, his order forbidding Argonians from entering the city, and claims that he only concerned himself with the problems of his Nordic constituents. The Great War broke out between the Aldmeri Dominion and the Empire in the latter half of 4E 171. According to Thalmor documents, Ulfric was captured by them early in the conflict and interrogated by Elenwen, who later became First Emissary to Skyrim. Through this interrogation, they learned his importance, and he yielded information which they then convinced him had been essential in their seizing of the Imperial City, though the city had actually fallen before he gave up the information. They eventually allowed him to escape. The Reachmen, a tribal group of primarily Breton descent, seized the opportunity provided by the Great War to rebel and establish their own kingdom in the Reach in 4E 174. The Great War ended two years later with the signing of the White-Gold Concordat, which, among other things, banned the worship of Talos in the Empire. The Reachmen had purportedly spent the two years successfully governing themselves in relative peace, and began the process of being formally recognized by the Empire as a legitimate and independent kingdom. Desperate to regain control of the Reach, Skyrim accepted the aid of a Nord militia led by Ulfric to reclaim the hold from the native Reachmen, in exchange for permitting the free worship of Talos in Markarth. Igmund, son of the Jarl who had died in the uprising and future Jarl, admitted that they offered religious freedom under the hope that the Thalmor wouldn't find out about the arrangement. However, Igmund's hopes were in vain, as by this time Ulfric was purportedly acting as an asset for the Thalmor, albeit reluctantly. Ulfric led the militia to recapture the Reach, in what would become known as the Markarth Incident. It is rumored that Ulfric used the thu'um to achieve this victory, and he ultimately overthrew and captured the Forsworn leader, Madanach. When Markarth was returned to Imperial control, the free worship of Talos there was officially permitted, a condition Ulfric demanded before he agreed to cede control of the city. Until then, the Imperial Legion had been largely ignoring Talos worship in Skyrim, but the Thalmor used the opportunity Ulfric provided to demand rigid adherence to the Concordat, and the Empire ultimately reneged on the agreement with Ulfric. Thus the incident was a key factor in bringing about the Stormcloak Rebellion. Following the incident, Ulfric reportedly became uncooperative to direct contact with the Thalmor, and he was eventually deemed by them to be a dormant asset. Following the Markarth Incident, Ulfric was arrested. His father, The Bear of Eastmarch, died while Ulfric was imprisoned, and Ulfric delivered his eulogy via a letter that he had smuggled out of prison. He was eventually set free and returned to Windhelm, where he took up his father's place as Jarl. Upon the death of High King Istlod, the Moot was convened to formally name his son Torygg as the new High King. Though the Moot only convenes as a formality when a High King dies with a direct heir, Ulfric used the forum to voice his desire for independence from the Empire. Torygg knew Ulfric as a war hero and respected him, and the daring he displayed during the Moot further impressed the younger Nord. Soon after, Ulfric traveled to Solitude to see the young High King. Torygg and his court believed Ulfric had come to further discuss his desire for Skyrim's independence, and welcomed him. By the time they realized Ulfric was there to challenge Torygg, it was too late to stop it. Under ancient Nordic traditions, Torygg had no choice but to accept Ulfric's challenge for the throne, lest he risk losing face for an act of cowardice, which would lead to a recall of the Moot and likely his deposal as High King. Accounts differ on what happened next. According to Ulfric, he knocked Torygg to the ground with the thu'um, then dispatched him with a sword. Rumors circled amongst the people that Ulfric's shout literally tore the young High King to pieces. 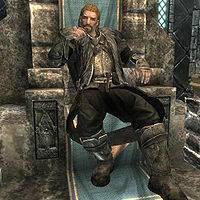 Ulfric's supporters claimed that Torygg was a traitor to his people who deserved to die and that Ulfric's victory rightfully made him the new High King. Ulfric's detractors insist that there was nothing honorable about his challenge, and they view Torygg's death as unforgivable murder because Ulfric did not exhaust his diplomatic alternatives. Additionally, Torygg was of a young age with limited martial training, while Ulfric was a grizzled war veteran wielding the power of the thu'um. According to Sybille Stentor, the Court Wizard of Solitude who had helped raise Torygg, the young High King likely would have given Ulfric's request to emancipate Skyrim from the Empire serious consideration, as he held Ulfric in high esteem. Ulfric managed to evade capture and fled back to Windhelm, where he called upon all "true" sons and daughters of Skyrim to join him in rebellion. The jarls of the Rift, Winterhold, and the Pale sided with his claim. Despite his enmity toward Ulfric, Jarl Balgruuf of Whiterun initially refused to take a side. The jarls of the Reach and Hjaalmarch supported the Empire's claimant, Jarl Elisif the Fair of Haafingar, the widow of the late High King Torygg. Initially, Dengeir of Stuhn, the Jarl of Falkreath, supported Ulfric, but he was replaced by his nephew, Siddgeir, who favored the Empire. Eventually, in 4E 201, Ulfric and a small company of his bodyguards were captured by General Tullius in an ambush while en route to the small town of Darkwater Crossing. They were bound, Ulfric was gagged, and they were brought to Helgen for execution. However, a surprise attack by the ancient dragon Alduin devastated the town. Ulfric exploited the chaos to escape, purportedly with the aid of the Thalmor, who wished for Ulfric's rebellion to continue so Skyrim would remain divided and distracted. Ulfric returned to Windhelm and continued his campaign. Sometime after the revelation of the Last Dragonborn, Ulfric stepped up his campaign by besieging the city of Whiterun, the capital of his old rival Balgruuf the Greater. Balgruuf finally sided with the Empire in order to enlist additional aid to defend his holdings. ^ a b c d e f g h i j Events of Skyrim. ^ Scouts-Many-Marshes' dialogue in Skyrim. ^ Kibell's dialogue in Skyrim. ^ Alvor's dialogue in Skyrim. ^ Jarl Igmund's dialogue in Skyrim. ^ a b Ulfric's dialogue in Skyrim. Esta página foi modificada pela última vez à(s) 17h55min de 28 de fevereiro de 2015.